At Alpine Lumber’s new 80,000 sq. 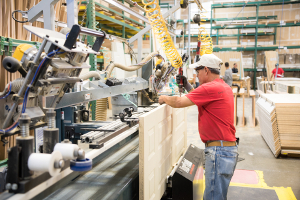 ft. Denver Millwork facility, we pride ourselves on providing quality, on time, and complete delivery of Door and Millwork products to our professional builder and remodeler partners. Our recent move into a larger, more efficient facility allows us to meet and exceed current market growth and customer expectations. 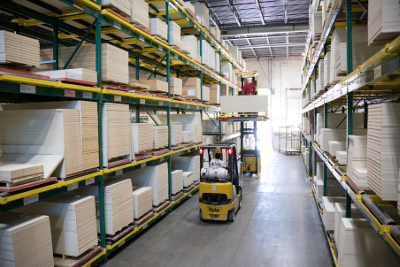 While increasing our inventory levels, manufacturing capability, and shipping capacity (expedited with our state of the art On Time In Full automated Dispatch and Delivery tracking software) we’ve also incorporated a world class 7,000 sq. ft. custom showroom, where we display a large variety of doors, trim, finish applications, and hardware. While we utilize state of the art handling, production, and delivery equipment, we also believe that true quality can only be attained by having our associates take a “hands on” approach throughout our assembly, loading, and delivery process. This approach assures that we are able to quality check all products during the entire process.